"Switzerland of Asia" Kashmir is World famous for its beauty from ages old and one of the Great Mughal Princes has praised its beauty by calling it a " Paradise on earth ! " The Valley of Kashmir is full of the mighty mountains, Lush Greenery , blossoms of pinks , whites, yellows and flowers of all the rarest varieties. Rainbows spread across the blue skies. Meadows are spangled with daisies , flower beds with pansies, primroses, hyacinths and daffodils grow all over. Almond, cherry, apples strawberries are in abundance. Rivers, Lakes, snow-caped mountains, dense forests, Hill stations you can't think of any heavenly beauty which is missing in this piece of heaven ! 95 km. east of Srinagar, 2400 mt. above sea level. Popular holiday resort. It is called �Shepherds village� at the head of the Lidder valley. 56 kms from Srinagar, one and a half hour journey, 2690 mts above sea level. .It is called �Meadow of flowers�. In summer best for trekking, golfing and pony rides . One can have beautiful walk around and can see in good weather the high mountains like Naga Parbat (In Gilgit) 7650mts high, Kolohi and Harmukh which are 5425 and 5124 mts high. Gulmarg has the world�s highest green golf course in the world. Neel Nag of Yusmarg would have been one among the sources of Jehlum, the second source (present) day source at Verinag was the third source of the river. However, the geologists widely are of the opinion that Neelnag (Yusmargh), whose water level always remain constant even in the rainy days owes to the reason that it must be contributing its precious water to �Verinag� owing to the transfer of water from lake at higher altitude to the lake at lower place. 87 km. from Srinagar, 3 hours journey, 2800mts above sea level. It is called Golden meadow� at the head of the river Sind with beautiful mountains and glaciers. The Abode Of Love.� Is said to have been a village, built by Paravarassna II. He used to stay here when on a visit to Sukhswami a saint living near Harwan. 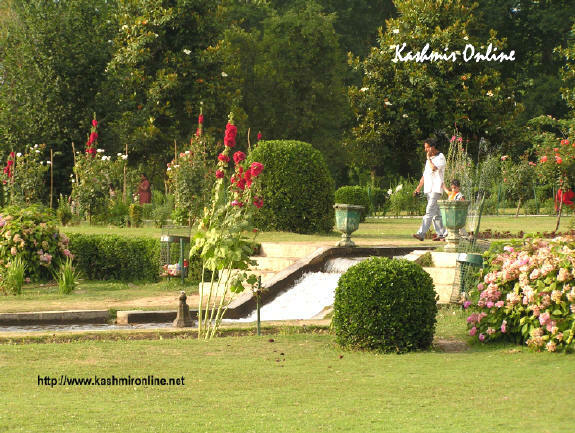 In 1619 Jehangir ordered a garden to be laid out this spot, calling it, Ferrah Bakkash (Delightful). In 1727 A.D Zaffar-Khan. A governor during the reign of Shah Jahan made an extension of it and called it �Faiz Baksh� (Bountiful). The garden is laid down in four terraces, rising one above the other. A canal runs through the garden lined with polished stones and supplies with water from Harwan.Chasma � Shahi : East of Srinagar. Built in 1634 A.D by Shah- Jahan. It commands a superb view of the Dal Lake it has the advantage of having a natural spring of Pure, Cool and Sparking water known as Chasma- Shahi (Royal Spring). it was a school of Astrology built by Dhara Shikua, Shah Jahan�s eldest son for his tutor Muhlah Shah. School of observatory. Hari Prabat: The Hill of Hari Parbat crowned by the pathan fort who his visible from every part of the city. 400 feet above the plain, Legend says the hill grew from a pebble dropped by the goddess Paravati to crush a demon, in the form of Sharika bird (Maina). This is called now Hari Parbat. Shankrancharya Temple: This Temple is situated at the height of 1000ft above the plain. The earliest of all the Temples built in 200 BC,. By Jalaka the son of the Great Buddhist convert Ashoka. The temple was subsequently rebuilt and dedicated by Raja Gopadittya in 6th Century. It is said to be that � the Takhut-I-Sulaiman (throne one of the Solomon). Hazrat Bal: It is the most important Muslim Religious place, situated on the western shore of Dal Lake. Tomb Of Zain-Ul-Abdin: The most attractive chapter of Muslim rule in Kashmir (1421-1472) in the reign of Zain- Ul-Abdin. In Srinagar�s Aquatic Plaza around the lake. Villages and Orchids and the Famous gardens built by the Moghul Emperors famous for Shikra ride. Most of the House Boats around in Dal Lake. From the Lake one can see the Historic Shankara Charya Hill in the east and the west Hari Parbat. The Largest fresh water Lake in India 26 Kms long and 8 Kms wide. Surrounded by the mountains. The river Jehlum passes right through the Lake the deepest part is near the Hill Called BABA SHUKR-UD-DIN on the north west side. Home of the Hangul: The Dachigam area has been protected to preserve its unique Himalayan range of Flora and Fauna. Hangul are Kashmir stag, one of the most endangered species of Red Deer in the world, this is the only place in the world with a viable Hangul population. Paradise for bird lovers: In the Park Leopard, Jackal, Hill fox, Himalayan Griffon, Lammergeier, Long Tailed Blue Magpie, Jungle Cat, Leopard Cat, Himalayan Weasel are in average numbers.